Today, I was a little taken back from what my Google Reader showed me. 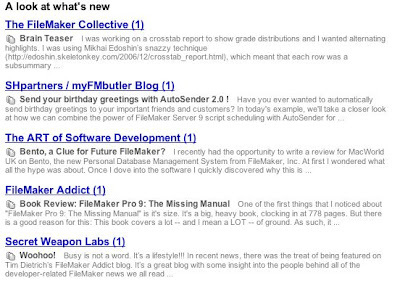 Five different FileMaker bloggers with new updates. Perhaps many of my other fellow FileMaker bloggers had the same dose of winter weather we received in the last couple days. I’m new to the news aggregator party but I’ve liked what I’ve seen so far. Google Reader is a free service that allows you to setup a bookmarked page to see what is going on in your favorite blogs. It looks similar to your email box and you can see your read and unread blog posts. Users can subscribe to feeds using either Google Reader's search function, or by entering in the exact URL of the RSS or Atom feed. New posts from your feeds are then shown on the left-hand side of the screen. One can then order that list by date or relevance. Items can also be organized with labels, as well as being able to create "Starred Items" for easy access. Older PostGreat Posts You Might Have Missed On FileMaker Addict!